Here’s another easy last-minute gift idea, one that I especially like for taking to holiday parties. It’s also adaptable to nearly any sort of occasion or event, so you might want to make several in different colors to stash in a drawer for emergency gift-making. 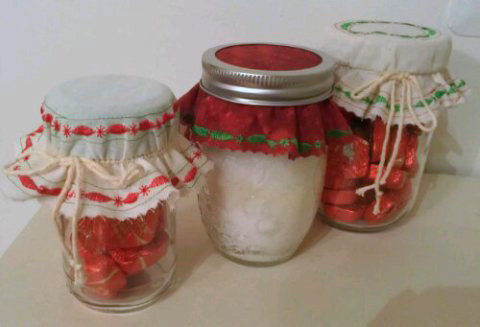 Fill a jar with treats – candies or cookies, bath salts or mani/pedi set and polishes, thread spools and sewing notions – then top it off with a pretty cover. Here’s a little gift for you all to say thank you for all the good things that have come my way this year because of my quilting friends. Last month I got to attend the BERNINA Ambassador Reunion where I was able to play with lots of fun toys! One of my favorites was the Circular Embroidery Attachment, which inspired this little project to create a quick-and-easy gift any time of year. If you don’t have this attachment you won’t miss out on the fun – I’ve included instructions for you, too. While this isn’t exactly a mandala, it does relate to my spiromandala quilts because it’s round, and it’s a great excuse to play with all those decorative stitches on your sewing machine that you somehow never get around to using! Click HERE for instructions. Visit ReNae at The Spiromandalas Blog. Next Next post: WeAllSew Celbrates Our Loyal Fans: 69,000 Fans!